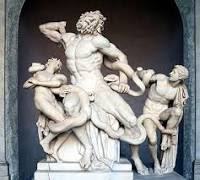 Oh, dear, I am not writing my blog much - I am feeling like Laocoon struggling with the snake (though I am not so muscular, I hope, or so male as he was). I love putting together this book but it's becoming quite a project, with more to read than I ever thought and so many more interviews to do than I ever guessed. 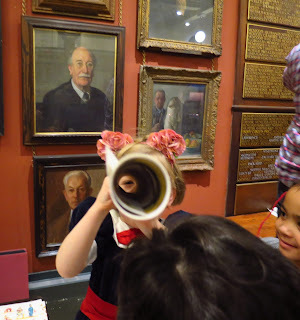 But we did get in a small group to attend the annual Pollock's Toy Theatre children's show with splendid tea. This was my third time, and they are such fun. The audience is divided between children between the ages of 3 and 7, and grown up toy theatre enthusiasts, and this year we watched "Aladdin." 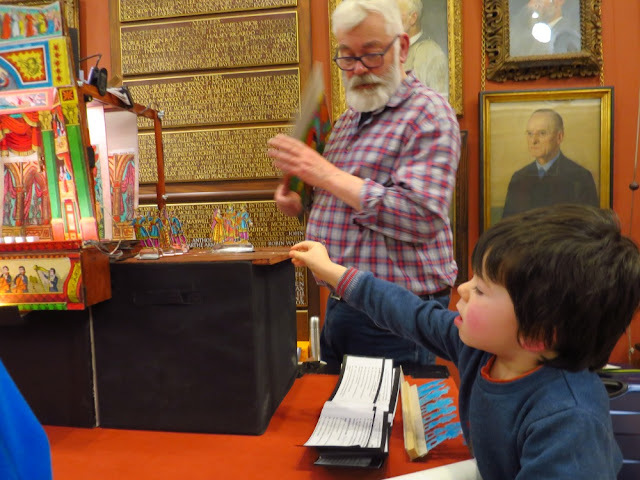 The performance, as usual, took place in the Art Workers' Guild, a most fascinating building set in a 200 year old house in a quiet London square. The house has several meeting rooms which various artistic and creative organisations like to hire - you can see the striking, portrait-lined main hall in the background of my pictures. The Art Workers Guild itself is a group of people working in the applied and fine arts. In the past, painters and sculptors were considered a social cut above the mere artisans who embroidered, made furniture, did metalwork, or created music, and the guild was begun with the aim of breaking down some of the barriers and respecting both types of artistic expression. The Guild is worth a post of its own, but if you are interested, go to the link, where you'll see some of the things they do. 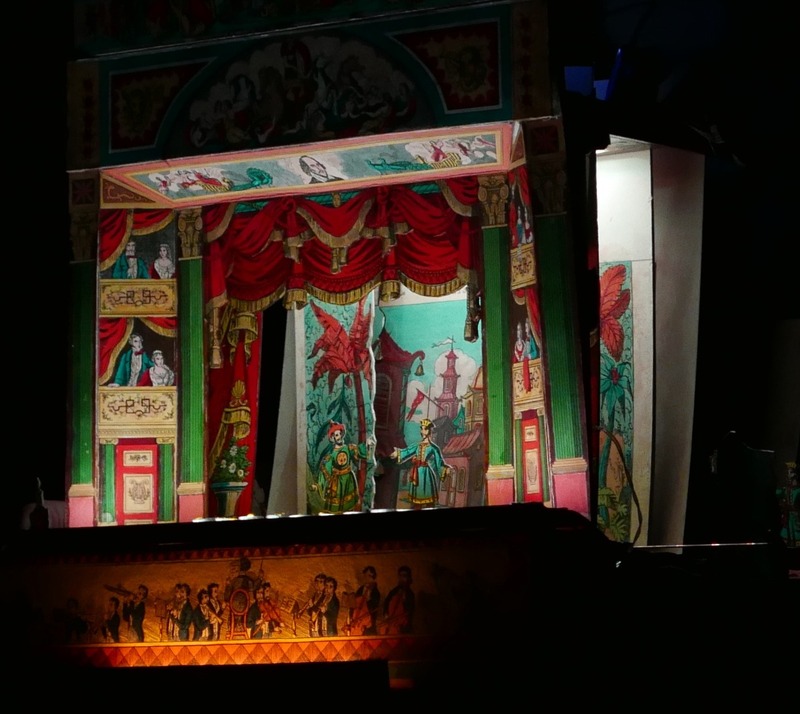 The toy theatre used in the performance is a large one, but even so it is not all that large, so is only suitable for playing to small groups who are able to gather round and see the stage. 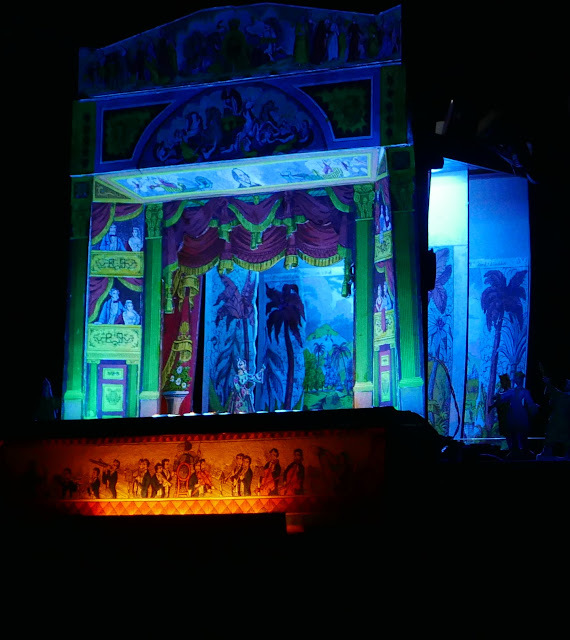 The brightly coloured traditional characters are fastened to sticks and pushed on and off the stage by the puppet-master, who also performs all the dialogue. Here is the puppet master, Joe - I mean the one with the beard. 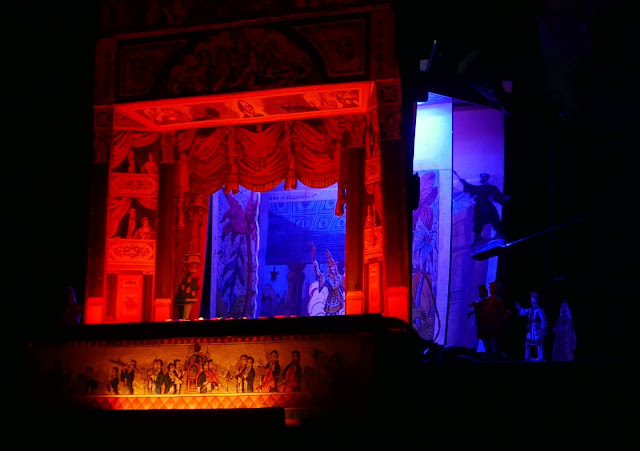 Although the theatre designs are completely traditional, some people now fit them with little electric lights, so coloured filters can create different atmosphere to suit the backgrounds which lift in and out to suit the story. Here is Aladdin meeting the wicked wizard in town. And here he is stranded in the cave where the magic lamp, the magic ring and all the treasure is stored. And here is Aladdin's wife planning the magician's downfall. The children loved it. Some might think it is too low tech for these days of iPads and Imax theatres, and it is is certainly very different from what they would normally see. But it reminded me of the way that children play themselves - Joe did all the voices with great gusto, moving his little cut out characters around as if they were toys, cackling horribly for the wicked wizard and sounding suitably foreign and mysterious for the genies. The kids completely related. Afterwards everyone wanted to see how it worked. The organisers had a stall selling large printed sheets of backgrounds and characters for just £1 each, and they were going very well. One small member of our party bought a sheet, eager to create a model theatre out of a cardboard box, and I heard it turned out very well at home. The tea afterwards, in an adjoining room, was truly fab, with homemade cakes, baguettes and marmite, chocolate stars, tangerines and other delicious things. The outing was declared a huge success by everyone and I think we could well return next year. I've found a copy of a 1927 silent newsreel feature which shows Mr. Benjamin Pollock actually making and displaying one of his theatres. In those days he was considered to be a relic of the old Victorian London that many people still remembered. Sorry for the poor quality - the original film has been transferred to digital pretty badly. It is nice that Pollocks' toy theatres are exactly the same as they were then. You can buy everything you need at their quaint shop in Scala Street, London, or at least you could the last time I popped in there a couple of years ago. Perhaps this evokes the inner child in all of us. It would be a shame if we ever lose that - and I don’t mean by reverting to senility! The Art Workers' Guild really is a lovely building and is perfectly located in a favourite London square. I can imagine a time when the fine arts gave more respect than the decorative arts, so it made perfect sense that people working in the applied arts in particular would want a respectful place. Nonetheless the portraits covering the main hall is a perfect display place for visitors to enjoy. For the space available, was the Pollock's Toy Theatre children's show too crowded? Children love puppets, and i am rather fond of them myself. One Sunday school i worked with had a puppet stage, and we got a lot of attention from the children when we used puppets, better than when we just tried to give them lessons. I would have bought a sheet or two. I remain unconvinced that tablets and ipads have made such events something kids will not relate to. We had a 'Punch & Judy' show some years ago and the kids sat laughing for 45 minutes without moving! Kids respond to anything, ipads etc do not deter them. Sounds like the book is hard work. Sadly that is what happens, you begin well and it leads you into every corner and never appears to end. I enjoyed this post. Low tech can sometimes express warm hearts better than printed circuit boards can. Oh Jenny! it is such a joy to see young children enjoying an afternoon like this instead of sitting isolated somewhere in a corner with an impersonal electronic device. I really have the feeling that many more parents are beginning to take time to do more things that are pro-active with their children now. What could be better than taking a walk and making it into a nature treasure hunt, swinging and climbing from trees, or just dressing up in old clothes and making dens under tables etc. This is fascinating! And although I doubt I would have been able to see much, what with my bad eye sight and the stage being so small, I probably would have enjoyed such an outing immensely, too, and would have bought some of those beautiful prints. I love paper art! and you could buy everything you needed this time, too. And I gave it some thought! I remember your earlier post on Pollacks and that was one of my favorite spots this time -- I was sorry Rick had opted for something else (music) that day. I loved the museum and toys, but what really captured me was the toy theatres because -- well, theatre and paper and all that is my thing. The video is fascinating -- I didn't think the quality quite so bad as I expected from your description, given the age of the film. I loved seeing how they worked, hearing about Joe - he sounds so talented! And your photos are just exquisite. Do they just do these shows in January -- that's something I would be wild about seeing for the next time list! I just looked at the art guild site. I would have to attend some of their talks, I think, if I lived in London. The backgrounds of the room you were in (here in your pix) show it to be quite a lovely and impressive space. Oh, I can't think of a better day out! You always manage to visit the most fascinating places. I've been intrigued by toy theaters since I was a child and it's wonderful to know that they're still in existence. There's so much creativity involved in the entire process. The 1920's video is really interesting. What a magical day for the children and the big children who got them there. Some things will always delight children and hopefully, children will always like to play/pretend with little characters. My six-year old grandson was doing exactly that this morning with two tiny toy men he had. He's always done this. I remember when he was very little, he'd pretend that salt and pepper shakers were characters and would act out little scenes with them in restaurants. He would love this charming theater. Maybe I am entering an age of 'I wish' but I would have loved to see that colourful show. Such a lot of effort goes into creating the scenery and I envy people for their talent. Oh, what a theater, Jenny! I'd love to see it with you too. I remember in my childhood I often went to see Toys and Puppet shows in Saint Petersburg where very talented actors were in those times. Gladly that young members of your party liked this Toy theater, despite on smartphones, I pads etc. Low tech it might be - but such fun for everyone. And great pictures! I think the tea would be my favorite part of that! I've been the same, Jenny! I need a good kick start (you know where) since Christmas/New Year. It's been so hot here, and humid...so I've not been feeling like doing anything, including blogging. I have been watching the tennis tournaments leading up to the Australian Open, though. The Open commenced this morning....through to 27th January. Hi Jenny, this is just wonderful. 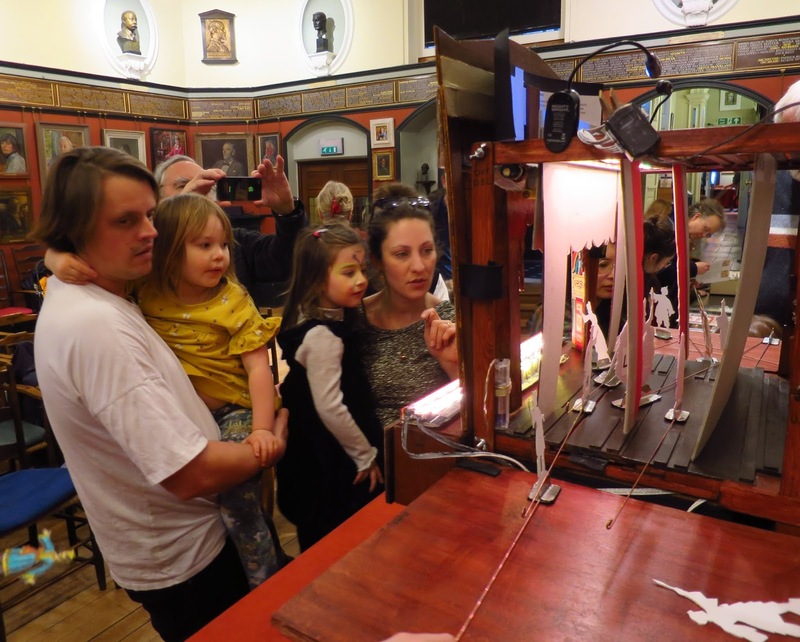 I loved reading about Pollocks Toy Theatre and I can see what a great treat it was for children and adults alike. I looked up the shop and found they have fantastic stock, from small to very complex, right there in Covent Garden. Our grandson, our own little Oscar Wilde, has loved theatre from an early age, and now goes to drama classes with much enthusiasm. When we next go to London, I will be there on Day 1 - (hopefully this year). Thank you for sharing it with us all. Dear Jenny – Looks like you had a great time. Toy Theater children’s show itself must be pleasant and it sounds perfect when the show was preformed at such a vintage structure and tea was served with delicious refreshments. Until the arrival of television,” Kamishibai", storytelling at street theater, was popular in Japan, but it disappeared as time went by. However, at kindergartens, children enjoy Kamishibai narrated by their teachers. Hello, this sounds like a fun day with the children's Toy Theatre show and the tea. I am glad it was a success. Enjoy your day and week ahead. A good way of getting children interested in things. You must have a great time. This was such fun to see and read about. Thanks, and I hope you're enjoying the start of the year. Took me back to my childhood and my dad making a shadow theatre with a screen of tracing paper mounted on a frame. It must have taken him hours to build: I've no idea how he found the time. He created moving, cutout figures and invented stories about Mr and Mrs Moody. The only one I remember featured Mrs Moody putting coal on the fire by climbing a ladder and shoveling it down the chimney - he had devised all the moving parts for this scene. Oh yes, I'm dreadfully late in commenting. The toy theatre looks like a fascinating, fun place. Thanks for sharing this, along with the marvellous photos. Fascinating! I don't think I've ever come across that before. I have heard from friends, who have visited Lisbon, that it is a lovely. Those tiles on the buildings are beautiful. The zoo in Jersey looks like a wonderful place to spend a day and enjoy all those unique animals. I do, though, havemixed feelings about zoos but realize all the good they do to preserve and protect the species for generations to come. Kindle Edition of "The Mystery of Lewis Carroll"
Click on the picture to buy it now with the Amazon link. Right now I'm writing a book on Mauritius and the naturalist Gerald Durrell - I interviewed him several times and will be using some of my unpublished notes. I'll be creating a page for this in the next couple of months. I'm a member of the British Guild of Travel Writers, and here are links to some of the travel pieces I've enjoyed writing in recent years. You can read about many more destinations in my blog posts - please use the Search box towards the top right of this page. And as for me, well, I love writing! 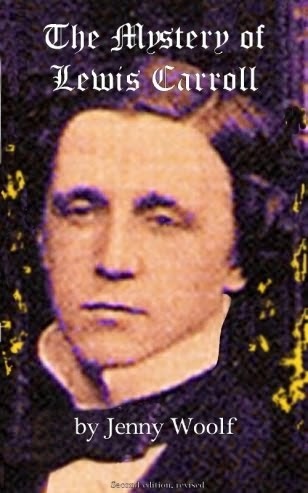 I'm the author of "The Mystery of Lewis Carroll" (Macmillans, New York) and also "Lewis Carroll in his Own Account" (Jabberwock Press) and other non fiction titles. I'm now working on a book about Mauritius. I've always been freelance ,and have contributed features and travel articles to a large variety of publications, national and international, and I was a contributing editor of the national US travel magazine "Islands" for several years. About the pictures on this blog. You're very welcome to re-use images you find here, but if you do, please could you credit me, and link back to this site. Thank you! If I recommend something here, it's ALWAYS because I think it's worth recommending. Like nearly all travel writers, I accept free trips and attend press events, but if I don't like it, I won't recommend it. 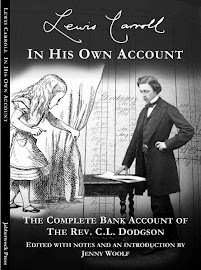 LEWIS CARROLL IN HIS OWN ACCOUNT, My Book about Lewis Carroll's Bank Account - Revised Edition now available! Click on the image to buy. All content Copyright Jenny Woolf. Simple theme. Powered by Blogger.